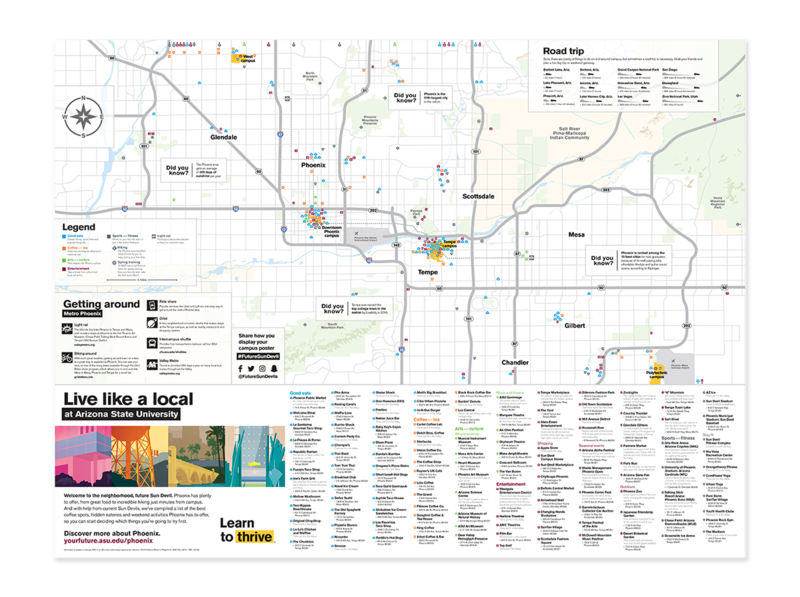 One of my favorite projects I've had the opportunity to work on are these ASU campus vintage-styled travel posters and a map highlighting the four ASU campuses in Phoenix's metro valley. These are sent out to incoming students to help them understand how Phoenix is laid out and to highlight some of the local hot spots surrounding each of ASU's campuses in the Valley. On the other side of the map is one of the four campuses — illustrated — travel poster style. Custom designed icons were used to plot points on the map and identify the different categories quickly and easily. "Getting around", "Road trip" and "Did you know" facts were added in to provide some additional information about Arizona and what students can expect when coming to ASU. 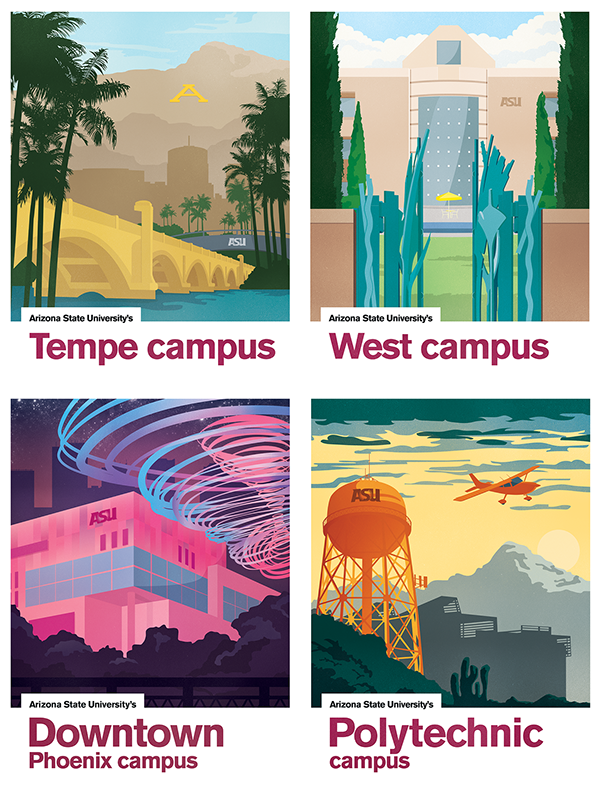 One of my favorite projects I've had the opportunity to work on are these ASU campus vintage-styled travel posters and a map highlighting the four ASU campuses in Phoenix's metro valley. 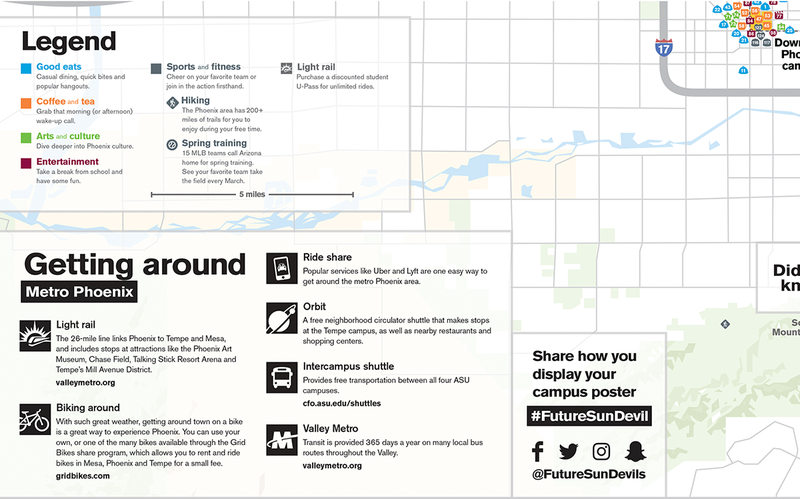 These are sent out to incoming students to help them understand how Phoenix is laid out and to highlight some of the local hot spots surrounding each of ASU's campuses in the Valley. On the other side of the map is one of the four campuses — illustrated — travel poster style. Custom designed icons were used to plot points on the map and identify the different categories quickly and easily. "Getting around", "Road trip" and "Did you know" facts were added in to provide some additional information about Arizona and what students can expect when coming to ASU.